Today I am honoring one of my favorite actors, Heath Ledger, who died two years ago today. His untimely death brought to a close the life of an actor who was just realizing his great potential and a father who adored his little girl. I myself have a constant reminder of Heath in my life. 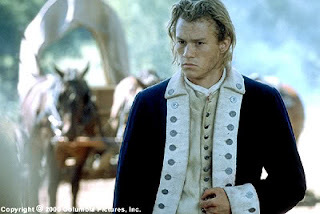 In 2000, Heath starred in The Patriot with Mel Gibson. This was one of his earlier films and I was already a fan, but I recognized that he possessed real talent. His character in the film was named Gabriel and this was the early inspiration for the name I chose for my eldest son. His name is Gabriel. I was so happy last year when Heath won the Oscar for his role in Batman posthumously. An honor I'm sure he still would have received had he not died so suddenly. I hope that wherever he is now that he is at peace. 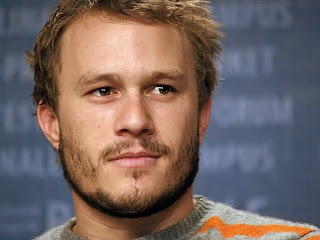 I remember you today, Heath. You are missed. Wow! It's hard to believe that it's been two years already! I enjoyed him in "Brokeback Mountain" and "Monster's Ball," too. I miss him too! My favorite will always be 10 Things I hate about you! He was a great actor who moved me in "Brokeback Mountain" and scared the hell out of me in the Batman movie. Thanks for the great comments...I know Heath can feel the love even now! I love all his movies, especially 10 Things, The Patriot, Knight's Tale, Brokeback Mountain. The problem is, I have such a hard time watching them because I get so sad that he's no longer with us. His performance in Brokeback, especially at the end, is so tremendously poignant...that's probably the one I have the toughest time watching now. I first fell in love with Heath in 10 Things I Hate About You. He was terrific and so beautiful! I cant believe it has been two years already. I thought he was an amazing actor and I loved him in Knights Tale - to this day one of my favorite movies!